SINGAPORE, Jul 26, 2018 - (ACN Newswire) - Regional Investor Relations (IR) specialist WeR1 Consultants are pleased to announce that its client, Grand Banks Yachts Limited, has won Best Investor Relations at the Singapore Corporate Awards 2018, clinching the Gold Award in the Small Cap category. Mr. Mark Richards, CEO of SGX-listed Grand Banks Yachts, collected the award at a gala dinner at Resorts World Sentosa, on July 18. The event was attended by Guest-of-Honour Singapore Minister Ng Chee Meng, who is also Secretary-General of the National Trades Union Congress. Grand Banks appointed WeR1 as its investor relations partner in May 2012, prior to Mr. Richards' appointment as CEO in 2014. Under his leadership, Grand Banks revamped its production yard in Johor, Malaysia, introduced new designs for two boat brands - Grand Banks and Palm Beach - and stepped up engagement with investors. Over the years, WeR1 played a key role in lifting Grand Banks' public profile by initiating communications with the media and investor community, drafting comprehensive announcements for release on the SGX, and providing strategic counsel to management. In 2017, WeR1 assisted in planning and excecuting a shareholder tour of its Pasir Gudang yard in Johor as well as shareholder and analyst briefings at the Singapore Yacht Show. Mr Lai Kwok Kin, Managing Director of WeR1, said: "We are thrilled that Grand Banks has won the top IR award for Singapore-listed small-caps, which form the majority of companies listed on the SGX. We will redouble our efforts to help Grand Banks raise its investor profile and chart a new era of growth." 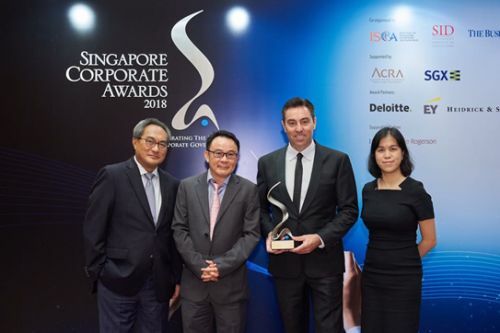 The Singapore Corporate Awards were launched in 2005 and aim to raise the standards of corporate governance among listed companies in Singapore. Companies are screened based on their Singapore Governance and Transparency Index scores as well as the responsiveness of IR contacts, and shortlisted based on criteria such as positive news developments and timely, high-quality financial information. The Awards are organised by the Institute of Singapore Chartered Accountants, Singapore Institute of Directors and the Business Times, with the support of the Accounting and Corporate Regulatory Authority and the SGX. WeR1 Consultants Pte Ltd is a pan-Asian communications specialist in Investor Relations, Tech PR, Crisis Communications and Litigation PR. With offices in Singapore, Malaysia and Hong Kong, our service is distinguished by a high level of strategy led by senior consultants with decades of experience in media, capital markets and communications. For more information, please visit www.wer1.net. With a renowned legacy that dates back to 1956, Singapore-based Grand Banks Yachts Limited is a global brand well known for its vast experience in manufacturing and selling luxury motor yachts. The Grand Banks brand is recognized across the globe for superior quality and craftsmanship which created one of the most acclaimed and highly sought-after yachts in the market today. The Group's manufacturing facility is located in Pasir Gudang in Malaysia. Grand Banks was listed on the SGX in 1987 (SGX:G50) and upgraded to the Main Board in 1993. In August 2014, Grand Banks completed its first acquisition - of Palm Beach Motor Yacht Co Pty Ltd, a manufacturer of luxury yachts with a reputation for impeccable quality that combines cutting-edge technology and modern designs. Palm Beach has its manufacturing facility at Berkeley Vale, Sydney, Australia, and builds yachts ranging between 42 to 65 feet. For more information, visit: www.grandbanks.com and www.pbmotoryachts.com.